This kid includes two adapter cables. male and female wiring , Plug the Nissan's FM antenna plug into the female end of one cable which will then plug into your interface or Modulator. 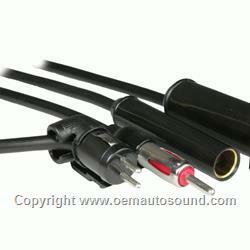 The output of the modulator plugs to the other adapter cable, which then plugs into your Nissan oem radio.